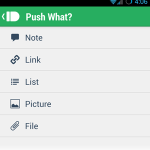 PushBullet makes it easy to instantly push files, links, notes, lists, reminders, addresses, and more to your Android phones and tablets, right into the notification tray. 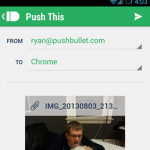 Why is PushBullet so useful? How is it different from, say, Dropbox for files? 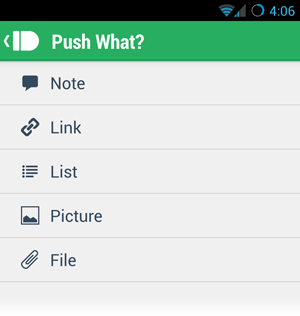 PushBullet is all about getting things onto your phone fast and right into your notifications for easy access. Lets say you want a PDF on your phone. Instead of going into the Dropbox app, finding it, downloading it, and then finally opening it, you can push it right from your computer onto your phone and into your notifications, where you can then open it with one click. No searching, no waiting, just easy and fast. Another great use is quick to do lists. 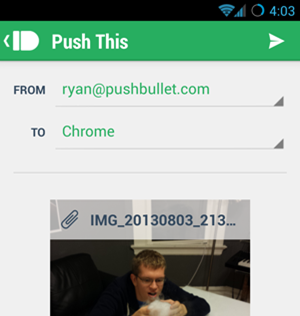 Just type up the list on either PushBullet.com or in the Chrome extension and push it right to your phone. It will instantly be in your notifications and if you click on it, it takes you to a checklist where you can check things off as you finish them. A great use for the checklist is a quick grocery list, and it gets even better since you can share your devices with other people. Want your significant other to grab a few things on his or her way home? Just push the list right to their phone. No lame email, just super convenient. And of course the Chrome extension makes it incredibly easy to push webpages and Google Maps addresses right to your phone. Found a restaurant you want to try out? Push the address to your phone and get to navigation in a snap from the notification. Same for YouTube videos and more! 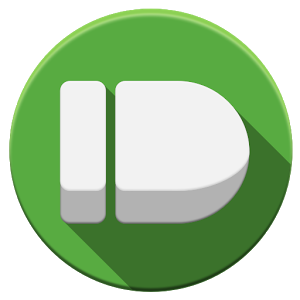 What’s more, PushBullet takes full advantage of Jelly Bean’s new notification features to show previews of images, lists, and notes. It’s pretty awesome, try it out! You can now push to Chrome on your computer with our updated Chrome extension!